Not everyone opens their action figures, but for those of us who do, it can be a trying and tiring process. Maybe you've always been someone who ripped open a package as soon as you could, and resulting in damaged figures and bent cardbacks. These tips will make sure you and your figures make it through the process safely. 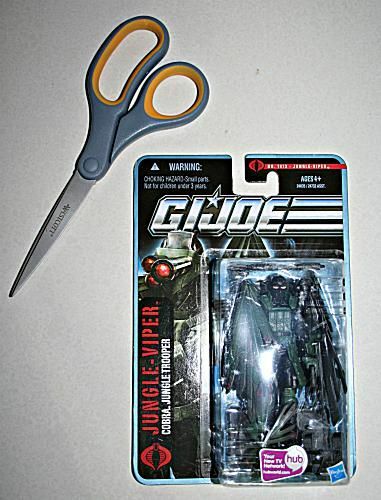 It's usually very easy to open an action figure package with just your hands, but to do the job in the most efficient and least damaging way, you'll need a pair of sharp scissors. A sharp knife also works but is much more dangerous, so scissors are recommended. They do the job just fine. You should keep the cardback from every action figure you purchase for future reference because they have lots of useful information and great designs. That means tearing them in two to get at a figure isn't an option. Insert the scissors into the plastic bubble carefully and as close to the card as possible. It can take some force to pierce the plastic bubble, so be careful but firm when pushing a single scissor blade into the plastic. Once inside by about an inch or so, begin cutting around the outside edge of the bubble, keeping the scissors as parallel as possible to the cardback. It's also important to make sure your scissor blades aren't touching the figure inside the bubble as you cut because they can easily scar the paint or nick the plastic. Slow and steady is the proper method here. This may seem like an obvious step, but there is one important thing to do here. Make sure you don't lose any accessories in the process. If you just start ripping at the individual pieces of the bubble, accessories can easily topple out, never to be found again. It's important to take apart a figure in a flat, well-lit, open area so pieces don't disappear as easily. Carefully pull apart the pieces of the bubble and take note of each and every accessory inside before you begin tearing pieces out and placing them in a giant, disorganized pile. This is the step that can cause the most trouble if you're not very careful. The way many action figures are packaged now, it's very easy to bend or even break limbs when pulling them out of the packaging. The plastic bubble is molded to fit the limbs of the figure, and if you begin tugging the figure, sometimes a joint will break before the bubble will give. To prevent this, the first thing you should do is see how exactly the figure is held in place. If the bubble is molded all the way around a figure's limb, it may be necessary to cut through the bubble using your scissors. If the figure is just being held in place by a tab of plastic (as seen above), use your thumb to push into the tab and open up space to remove the limb. It may seem like your figure has finally escaped its prison, but there is often one more step. Many manufacturers now use small rubber strings to secure both the figure and the accessories into the package. These small strings can be seen above. If these strings were like rubber bands, it would be very easy to just pull them apart and slide your figure out. They instead stretch very little, so pulling at them is usually an act in futility. It's much easier​ to lift the strings slightly, and then take your scissors and very carefully slide them between the strings and the figure. Then one quick snap and the string is gone. Don't point your scissors straight down and trying to clip the strings, as you may clip the figure as well, scarring the plastic. Sliding the scissors is a much safer bet. That should be all you need to get your figures out safely and efficiently. Once they're out, all that is left is to enjoy them.